You haven’t been to Lovina without seeing the dolphins! You can see dolphins swimming in their natural environment by taking a boat out at the crack of dawn (5:30 am). You can book the tour directly through our hotel. 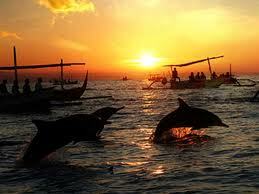 For dolphin combined with snorkeling, the price is 200,000 rupiah. Last updated by Ammanda Naibaho at November 23, 2014 .